Uncharted: The Lost Legacy review: "There’s a depth there that just hasn’t existed before"
There’s no doubt that most of Naughty Dog’s brilliance is in making characters that you can believe in. We’ve been following the ruggedly handsome Nathan Drake for years, wanted to be best pals with Sully, and might have fallen a little in love with Joel and Ellie from The Last of Us. There aren’t many studios that can bring back two villains from the Uncharted series and make them into heroines that manage to overshadow even the Tomb Raider herself. But Naughty Dog does exactly that in Lost Legacy. You might remember Chloe Frazer from Uncharted 2, who was initially one of Nathan’s girlfriends, but ended up becoming a bit of a backstabber. 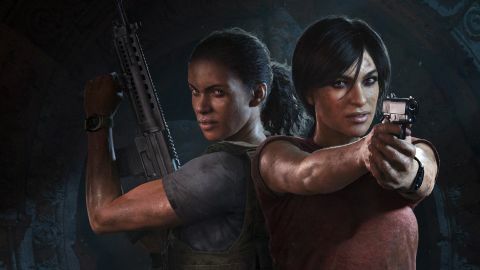 Well, she’s your new heroine for The Lost Legacy and her treasure-finding partner is Nadine Ross, head of private military company Shoreline from Uncharted 4. Chloe has the bravado and wit of Nathan Drake, but is much more subtle and grounded than Drake has ever been. The interplay between her and Nadine bounces from sarcastic jibes and insults to deeper emotional chats that haven’t really been found in the Uncharted series to date. It’s more along the lines of dialogue you’d find in The Last of Us, which definitely isn’t a bad thing. The way their relationship develops as you discover parts of their past is an integral part of this story. They’re focused on trying to track down Ganesha’s tusk, steeping the game in a ton of delicately handled Hindu theology woven in with myth and rumour - as is the Uncharted way - but the way the pair come to find mutual respect for each other is almost more interesting. You’re learning and discovering these characters as they are, so while they might feel familiar they’re also brand new and incredibly compelling characters. It’s a brilliant start to what will, no doubt, be a brand new story arc for the Uncharted series. Nathan Drake’s antics ended with Uncharted 4, but there’s plenty of scope to take Nadine and Chloe further in future games. This is a much more nuanced form of Uncharted storytelling that still combines the combat, treasure-hunting and witty one-liners of old, but this time around its the character growth that will draw you in. There’s a depth there that just hasn’t existed before, both for the heroines and other characters including new villain Asav. But elsewhere it’s very much business as usual. It’s clear from the combat and traversal that this was once intended to be story DLC for Uncharted 4 before becoming a stand-alone title. Add a long wig and tighter fitted jeans and t-shirt to Nathan Drake and you’re halfway there, basically, as Chloe uses her grappling hook to swing from platform to platform just like Nate. Similarly, she nestles in the long grass as Nadine crawls up beside her. It’s all very familiar, and aside from some new weapons including some handy C4, it’s Uncharted gameplay to its very core. The Lost Legacy also continues the pockets of open-world gameplay introduced by Uncharted 4. Whereas Uncharted 4’s Madagascar felt like there were linear paths within an illusion of an open world, The Lost Legacy has much more success at actually giving you room to explore. It’s nothing like the truly open worlds of Horizon Zero Dawn or The Witcher 3, of course, but more of a hub like those featured in Rise of the Tomb Raider. It’s a central area full of story-related content, as well as secrets and collectibles to discover by driving around in your 4x4. But that’s not where the similarities to Uncharted 4 - or other Uncharted games - end and unfortunately this is where The Lost Legacy stumbles. Like its predecessors, the game's brilliant storyline is interspersed with big action sequences... but the problem is that it feels like all The Lost Legacy’s biggest action moments are lifted straight out of other Uncharted games. There’s a rooftop chase where you’ve got to climb over hanging shop signs, a fight with an armed helicopter, a fisticuffs boss fight that’s basically QTEs without the prompts, and a car chase where you’re scrabbling up your rope to climb into the back of the car, just to name a few. Each one is reminiscent of a near identical sequence from Uncharted 2 or Uncharted 4 and it’s painfully obvious. On the one hand you can write it off as fan service, with The Lost Legacy acting as an homage to the entire series, picking out the best bits that have made the adventures of Nathan Drake so popular and long-lasting. But for those expecting a spin-off like The Last of Us: Left Behind, full of inventiveness and lovely moment to moment play, you might come away feeling a little disappointed. The action itself doesn’t feel anywhere near as fresh, to the point that the last hour or so of this 6-8 hour game feels so familiar it verges on boring - aside from the well-executed cutscenes. Thankfully the game is visually breathtaking too, with the kind of vistas where you can’t help but quickly switch to photo mode - usually moments just before Chloe herself whips out her phone to take a near identical shot. Combine this beauty with the fact that Lost Legacy's storyline and its characters are so engaging, and it’s easy to forget you’re pretty much replying the old games with a few name changes and a bunch of extra locations. And besides: more Uncharted is never a bad thing anyway.